Re: Changed topic to here. no more EMPTY,full house untill i cant join and need to wait for slot=.="
as topic said, i will set the server only allowed new client of CS1.6 such as, Digitalzone, V36 dual protocol and DustFever repack client. So please get yourself choose a client and download it. 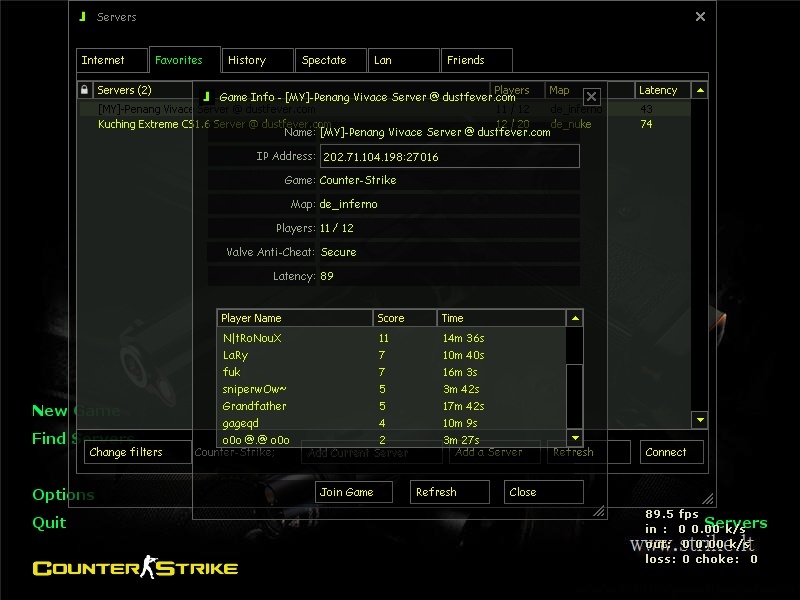 On 1st of January of 2010 i will set the server only accept new client or protocol 47 and steam client. So still left 2 week from today for you all to download the new client. Sendspace Download : [Part 1] - [Part 2] <-- need download both part 1&2. Megaupload Download : [Part 1] - [Part 2] <-- need download both part 1&2. P/S : i will upload more download tomorrow. Firstly i already set the date and i posted up this decision 2weeks before it had started and yes it is abit fast notice for all and i didnt even post up in DustFever forum where there got 10-20% of supporter out of 1k Forumer at there and I didnt even mail to every forumer at here. 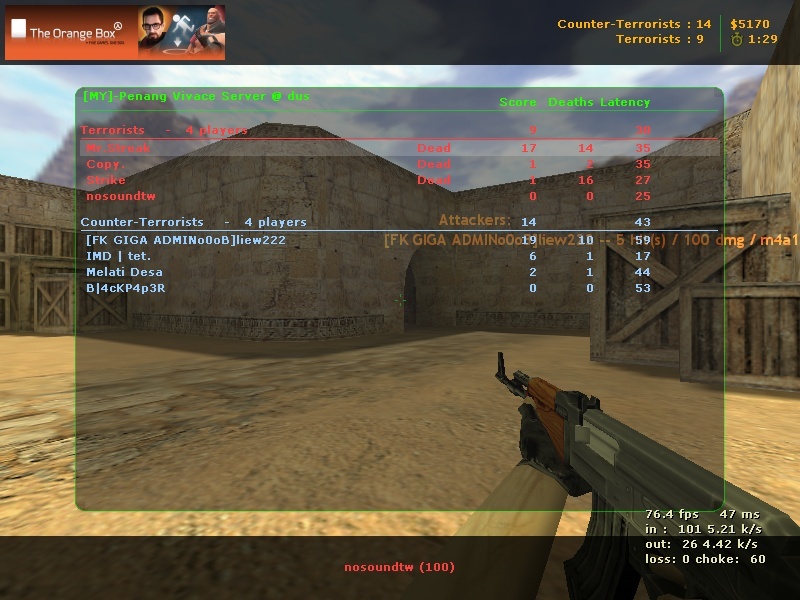 I dont mind if there is a player or not in the server but i just want other player to meet pro instead of hacker. Protocol 48 Nonsteam or Steam client all also can injected or bypass the hack but advantage for us is their client all got personal steamid, so once we ban they couldnt join until we unban them. I notice that server now is alot of steam player compare to last time where only admin using steam to play other player all is non steam and using old version of client. we are tired of banning IP, thoose hacker like to disturb the server whenever is full of player and no admin around, At that moment the server still will drop down from 11/12 to 0/12. 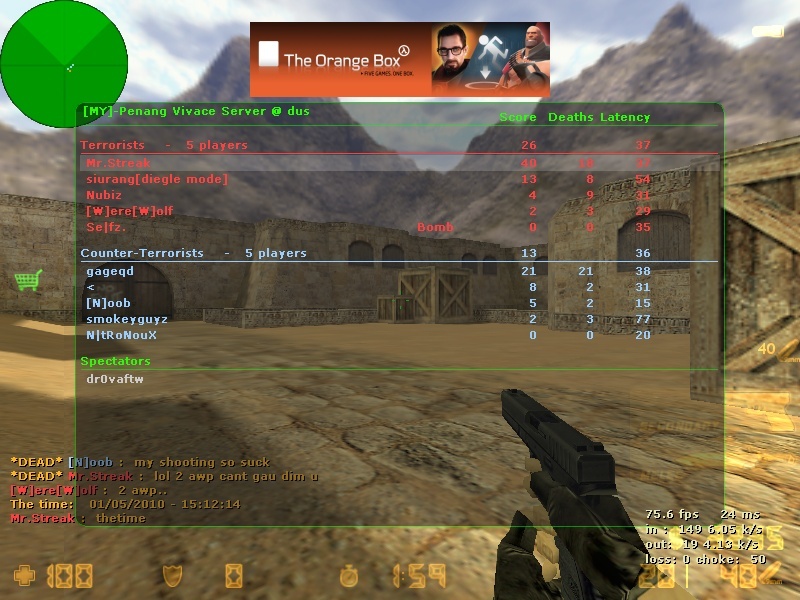 and maybe 40% of player come from cyber cafe, mostly cyber cafe including FTZ all also using old client so if a player who want to disturb the server the just inject the hack into the client and come clear the server player, but if the inject on new client and we able to ban the client steamid next time the player wont able to come in anymore unless he reinstall the client or use other pc to hack. and lastly for thoose who download and play in vivace i sincerly thanks for the support u given to us, for thoose who still doubt about advantage of downloading client then you may choose either you want or dowan, no forcing from me. And please no flame or war posting after this else i will made up my mind to ban whoever involve in the war posting. Including admin. LOL...ur posting make me laught..
okay, be straight to point. 1. metallics, each time you posted something, it seemed to be liking to stir up a mess. if you love cs, upgrade it. if you don like. forget it. no points arguing with others and keep flaming with each. upgrading the client doesn't mean you cant join other servers. if you don't know such knowledge, study more instead of whining here. 2. the rest of admins/players whom joined in this stir. please stop it. you guys also suka-suka mau kacau with him only. thanks. ps: we cant manage to always watch over players attitude problems. but we would still take actions if things going off hands,taking along the considerations whose always the culprit. I'll lock this topic to avoid further disturbances.